We do not recommend the use of standard strength stainless on braking or suspension systems. 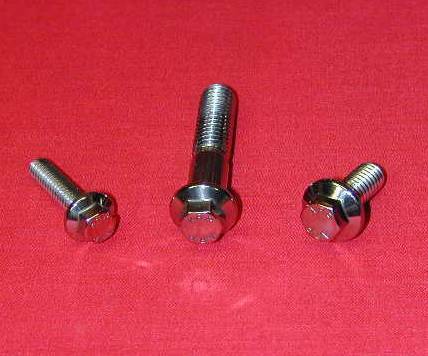 We offer a line of high strength stainless fasteners for these purposes. Always refer to the application guidelines of the original manufacturer. AlloyBoltz will not be held liable for any loss, damage or injury resulting directly or indirectly from the use or misuse of any product we sell. It is the customer’s responsibility to determine if the product is suitable for its use and application. Alloyboltz guarantees that you will be happy with our products and service. If you have any problems or questions, please call us at 813-645-3185 or email us at RNIM421@AOL.COM. YOU MUST USE ANTI-SEIZE AS A REGULAR PRACTICE, PARTICULARLY IN BLIND HOLES OR WITH NYLON INSERT NUTS- IF YOU EVER WANT TO REMOVE THE FASTENER. LOC-TITE IS NOT RECOMMENDED FOR NY-LOCK NUTS. USE ANTI-SEIZE! IT’S AN ABSOLUTE REQUIREMENT WITH ALUMINUM! ON APPLICATIONS WHERE THERE IS VIBRATION, BLUE OR RED LOC-TITE CAN BE SUBSTITUTED FOR ANTI-SEIZE ON THE BOLTS. DO NOT TORQUE OUR FASTENERS OR ARP FASTENERS TO THE MANUFACTURERS’ RECOMMENDED VALUE WHEN USING ANTI-SEIZE OR LOC-TITE! 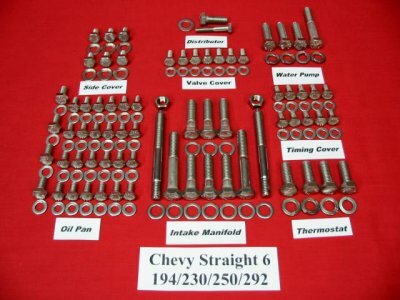 YOU WILL PROBABLY DAMAGE THE BOLT THREADS OR THE THREADS YOU ARE THREADING INTO. THESE LUBRICANTS REDUCE THE AMOUNT OF TORQUE REQUIRED TO ACHIEVE PROPER TIGHTNESS! All Torque Values Will Change When Using Stainless Steel. Always use a lubricant for stainless steel applications. Alloyboltz guarantees the quality of our products. If you are not pleased or just want to return your order, you have 30 days from the date of purchase to do it. You have to pay return shipping. We only allow cancellation of our custom Show Polished Kits or Fasteners if the request is made before we start the polishing process. After that, we do not accept returns as the bolts have been modified from their original condition.